There was a hullabaloo (talk about an archaic word, but there you have it) at the middle of April when Oreos announced a new flavor. Of course, when I saw them in the store, I had to try them. It's a public service I provide, you know. Ah Pop Rocks. I remember you from the early 1990's. They were mildly amusing then. Carole didn't like them. She wasn't thrilled with stuff exploding in your mouth. 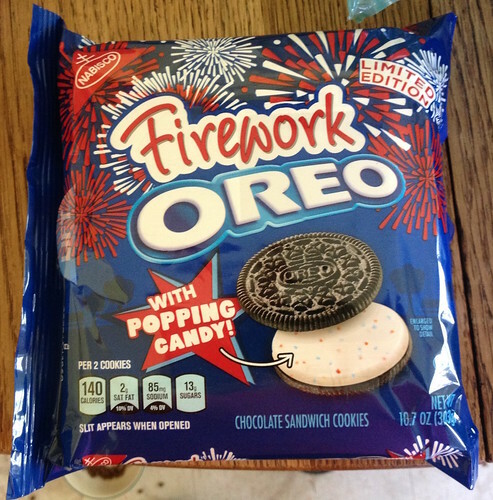 Let's see how the combination of Oreos and Pop Rocks goes. Meh. I was expecting more of an explosion. There wasn't much taste to Pop Rocks, if I'm remembering them correctly. My memory leaves me with the impression that the smell upon opening the bag was more pronounced than the actual flavor. This was the same impression with Oreos. You had your typical Oreo cookie taste with an occasional pop when a fleck hit your tongue. Those pops were few, at least in my bag of cookies. Sigh. I just don't see that Oreo is losing market share to anyone. So, I'm really not certain why they feel the need to do something like this. It was underwhelming. Supposedly, there is or was, a waffles and maple syrup version of Oreos out there. I haven't seen those to try them. I'm intrigued, but, again, why mess with the greatness that is chocolate wafers with white stuff in the middle of them? I'm not sure you can find these anymore. I think they were out for Memorial Day and have disappeared from shelves. If, by chance, your retailer has a stash and puts them out for sale, save your pennies. These aren't worth it at any price.